We're glad that more enthusiastic point and shooters are collaborating with us and this time our guest photographer is Ajeet Sharma. 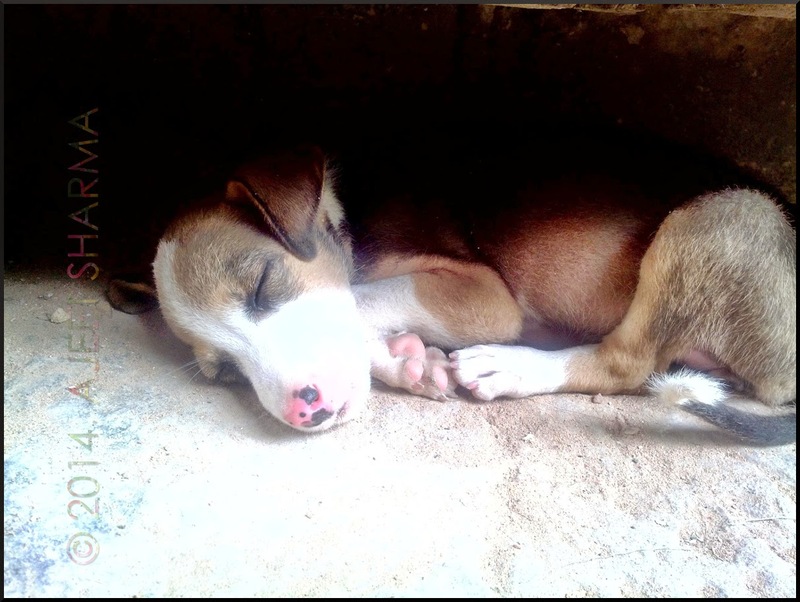 This is a picture of a stray pup sleeping under a massive door of one of the entrances of Humayun's Tomb in New Delhi. The thing that made Ajeet click it was how peacefully this little thing slept under that massive door, on a hot summer afternoon, under a relatively dark and cooler insides of the gate, amidst all the chaos created by visitors! As of now, Ajeet is a mobile phone shooter, enjoying and exploiting his Huawei U9200. He blogs at Metro Greens to document his journey as a plant lover. In next photo post, Old Goa Monuments series would start rolling in again... please do visit back. Super-cute snap ;-) Loving it! That's a cute picture there! I like dogs until they want to play with me.